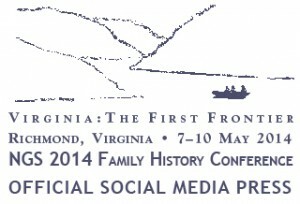 NGS 2014 Family History Conference – decisions, decisions! 7:00 p.m. Revolutionary Voices: History, Genealogy, and Documentary Film Techniques, by Maureen Taylor, et. al. I am THRILLED to be able to listen to Thomas W. Jones and Elizabeth Shown Mills in person, and am excited to have the opportunity to learn from the experts in genealogy. The countdown begins – twenty-two more days till show time! This entry was posted on Tuesday, April 15th, 2014 at 1:59 PM	and posted in Uncategorized. You can follow any responses to this entry through the RSS 2.0 feed. « Make your favorite historical society “Flip” today!